Marketing is not very easy. Finding the right words that will resonate with your potential clients can often be quite challenging. But there’s one thing that can help you when it comes to writing your website and marketing copy: story. In this article I’d like to share with you some of the key takeaways from one of my favorite marketing books, Building A StoryBrand by Donald Miller. Donald Miller is a student of storytelling. Stories are memorable. Stories capture the human spirit and keep our attention, especially if it’s a good one. When we tell a good story with our marketing, we move from just creating information and hoping to compel potential clients to actually inviting them into something bigger. You see, the one thing that is so powerful about storytelling, especially when it comes to your marketing, is that the human response is to place ourselves within a good story. We think about what we’d do in the hero’s situation. How would we overcome such a challenge? How can I be the hero?! And this is exactly what Donald Miller teaches you to do in Building A Story Brand. After writing 8 books and studying hundreds of movies, plays and musicals, he’s boiled down the essential elements of a compelling story. Your client is the character… you are the guide. Can you see how you could take this framework and write a story about your client’s challenges and how you and your private practice can guide them toward success? As I work with my clients to create compelling content and websites, it’s extremely helpful to be clear on the desires of the client(s) they are trying to reach. If you’re not clear on what your ideal client desires and the things keeping them from reaching those desires, your marketing may just fall flat. When you do know these things, you can craft compelling copy that resonates with the story they’re already living and give them the plan to reach success. What does the hero (your ideal client) want? Let’s say your client is a stressed-out professional and you want to create a landing page that attracts that client. You want to be free from the stress and anxiety caused by your demanding job. But even when you’re at home, playing with your children or trying to unwind, you’re still thinking about that last email that came in, the fire you’ll need to put out tomorrow morning when you get to work and the many projects you’re trying to balance. If you can’t find a way to manage these pressures well, you feel like your health will continue to slip, there will be more and more conflict with your spouse and you just might miss the best years of your children’s life. See the type of story that tells? Another aspect of great storytelling that can help you create compelling marketing for your private practice is the reality and tension of what’s at stake. In The Lord Of The Rings, we want to see Frodo destroy the ring in the fires of Mt. Doom and avoid the end of the world at the hand of the forces of darkness. We want resolution in our stories, and your potential clients most definitely want a resolution when it comes to their own. This is where you can paint the picture of what life can look like should a client choose to work with you. It’s also a chance to explain what life can look like if nothing changes for your potential client. This creates a vision of those deep desires that your client wants and gives them a plan (your services) to achieve those desires. Think about how your clients are feeling before working with you and how they may feel after. What does life look like before working with you and what could it look like after? Using this structure can help you craft extremely compelling copy for your private practice website that connects with potential clients and gives them hope for a better future and the motivation they need to take action. 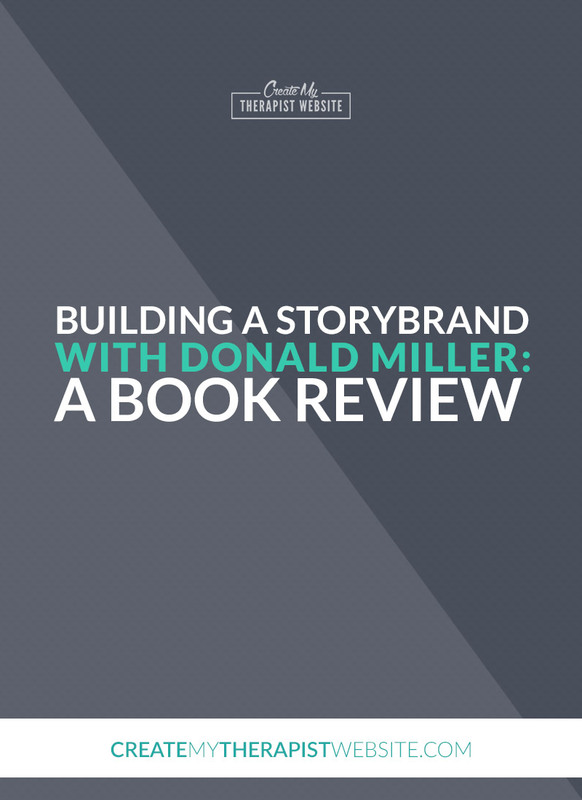 The above are just a few of my favorite highlights from Donald Miller’s book, Building A Story Brand. When I read this book, I dog-eared and underlined something on every few pages. It’s just that good! 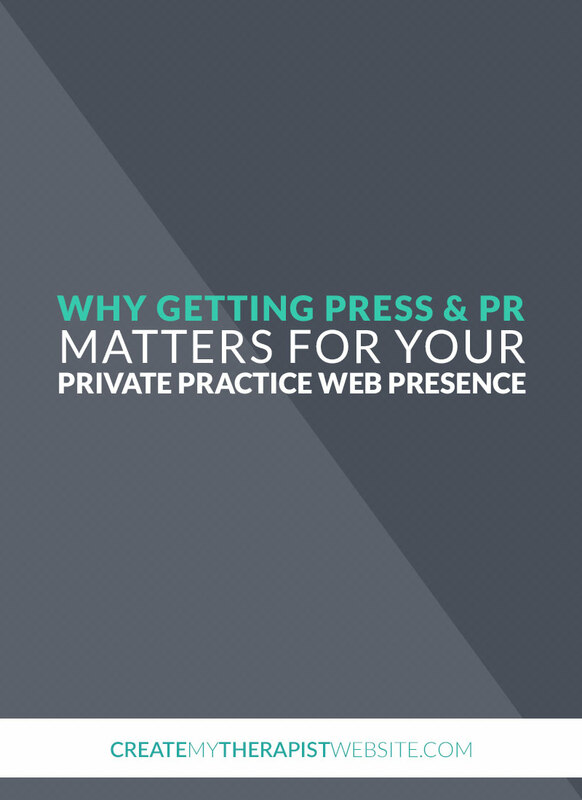 If you’re struggling with what to say on your private practice website or any other marketing you do for your business, this is a must read for you. 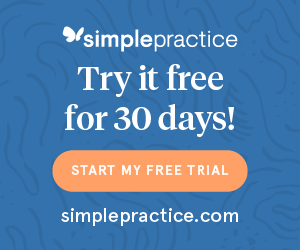 The simple framework gives you a structure to easily follow and prompts to help you avoid sitting in front of a blank computer screen and write content that will help you grow your practice. The book also comes with free access to a website where you can craft your own story script so you can refer to the key aspects of your ideal client’s story and use it to create consistent and compelling marketing copy. I hope you find it as helpful in your marketing as I did! Disclosure: The links above are affiliate links, and at no additional cost to you, I will earn a commission if you decide to make a purchase. Please understand that I only recommend products or services because I use them myself and find them helpful, not to make a commission should you choose to purchase something. Please only purchase if you truly feel that it will help you achieve your goals. After speaking to hundreds of psychotherapists across the country and internationally, the two most common challenges they reported were burnout and a plateau in their private practice business. 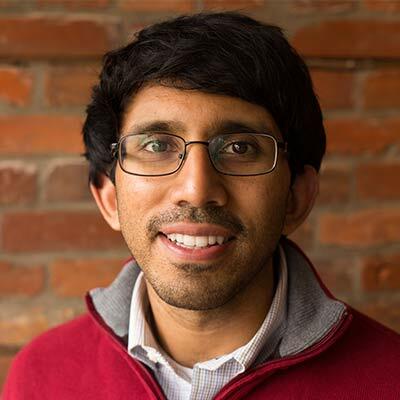 Unfortunately, burnout rates are high within the mental health field regardless if you work in a community clinic setting or in private practice. Our work as psychotherapists is personally rewarding and most of us enter this field with a passion to serve others. However, the profession is demanding both emotionally and physically. I experienced firsthand burnout and compassion fatigue which lead me to my journey of discovering coaching services. The number of mental health professionals transitioning into coaching is consistently growing every year. Psychotherapists are expanding their business model to include coaching services. The coaching industry is blooming and we are in an era where people are seeking a better future, going after their dreams, wanting to live a more fulfilled life, seeking personal development and solutions to specific struggles and obstacles. These individuals don’t meet criteria for a diagnosis or medical necessity for psychotherapy services. However, they are still in need of support and guidance from qualified coaches to help them live at their fullest potential. Trained mental health professionals are more than qualified to provide coaching services. Your education, training, and experience as a mental health professional sets you apart and is a huge advantage. Coaching is another option available to leverage your expertise and expand your business model to breakthrough financial plateaus and continue to do what you love – helping others. Here are four ways to know if adding coaching services to your business model is right for you. Do you enjoy working with clients on finding a solution to a specific problem, helping them design their future, and prefer a more direct approach with clients? Coaching services are present and future oriented with emphasizes on providing solutions for specific barriers, struggles, and problems. Coaching focuses on planning and goal setting with an action driven and direct service approach. You rarely dive into the client’s past and you never diagnose a coaching client. In coaching you are in a collaborative partnership with the client and moving away from the traditional medical model. Do you have passions, interests, and personal values you would love to incorporate in your work with clients and unable to do so with psychotherapy services? Imagine being able to incorporate your own passion, personal values, and interests in your work with clients. In coaching you are serving a specific niche whom you are passionate about and who you are best positioned to serve. You are in control of only inviting your dream ideal clients to work with you and enrolling them in your coaching packages. Perhaps you have overcome a personal struggle and now you desire to help those in similar situations. Or you desire to incorporate spirituality and who you truly are in your work with clients. The possibilities are endless with coaching. Are you in need of more flexibility in your life right now? One of the top reasons psychotherapists are attracted to a coaching business is flexibility. Flexibility in your day to day schedule and being able to serve clients from the comfort of your home or from anywhere in the word – all you need is your laptop and good reliable wifi. Flexibility to move across states if needed without interrupting your client’s services and your business revenue. You can serve clients from all over the world, no shortage of clients or being confined to market your services only within local communities. So whether you are in need of flexibility in your daily schedule to take your children to school or spend more time with loved ones or to travel the world, a coaching business might be right for you. Are you looking to increase your business revenue and improve or up-level your current lifestyle? Adding coaching to your business model is another option to increase your revenue while decreasing your caseload so you have more time and energy to dedicate to your clients and personal needs. Even with a part-time coaching business $5,000 – $10,000 monthly revenue is feasible. There really is no revenue cap in owning your own coaching business, it all depends on your goals, the lifestyle you want to create, and the business model you desire. It’s your choice. I invite you to set time aside to further explore and re-evaluate your business goals and personal goals. Where do you want your business to be in one and five years from now? 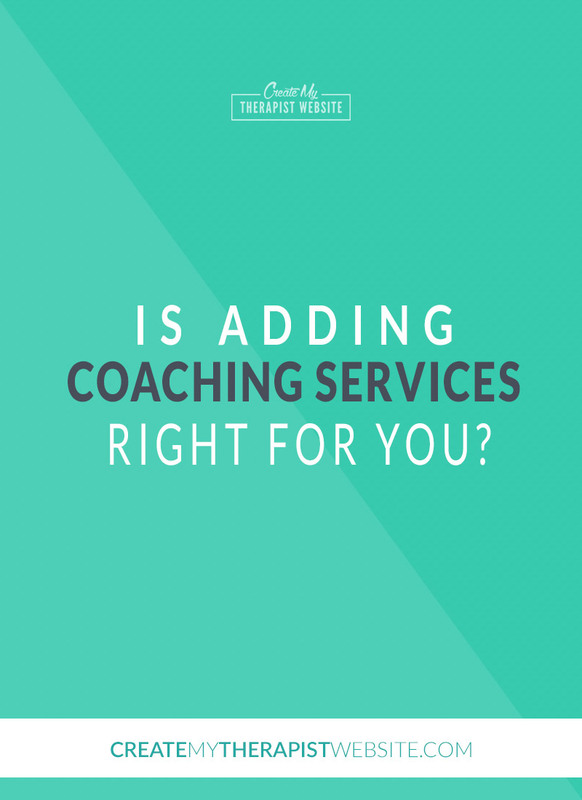 Does coaching services fit in those goals? Building a private practice is hard. Like any business, there can be ups and there can be downs as you figure out how to market your therapy services. But the great news is, you don’t have to do it alone. In this article, I’ll share advice from some of the leading coaches and teachers in private practice marketing. There are entire communities filled with successful therapists willing to share their support and advice on building a thriving practice. But there’s also a growing number of coaches and experts who have made it their mission to help you succeed in private practice and overcome your biggest marketing challenges. Whenever I need a little marketing inspiration for my own business, I turn to those who are further along and more skilled than I.
I listen to what they’re doing, what they’ve done and think about how it applies to my business. I applied the same approach to help you with YOUR business. I’ve compiled all their marketing wisdom into an info-packed PDF – free as my gift to you! If you find ways to market that feel authentic to you and your practice, the clients will roll in. Thinking you have to market in a way that worked for a colleague. There are at least 100 ways to market a practice. If you choose a few that are fun, you’ll be a more effective marketer and you’ll actually enjoy it. I’ve noticed that those therapists that select a handful of marketing activities that they feel excited about tend to be able to sustain those activities over time. Marketing requires this sustained, consistent effort but there will be no energy for making that effort if you’ve spread yourself too thin. Or, you’ll be doing a lot, but doing it poorly. So the first step is to take the time to put together a simple strategy. Next, schedule time for your marketing activities in your week and set some goals. I suggest sticking to a marketing strategy for 90 days. At that 90 day point, check in and see how things are going and shift as needed. Repeat this continuously and you will discover what works for you. Don’t do all the marketing activities that exist. Do the marketing activities that you have discovered work for you. Take a lot of deep breaths, get help and support when you need it, and have fun! I began to reframe marketing as “connection” and that’s been helpful for me. Because all of us are good at that as clinicians. Related to this, I’m a big believer in building a few relationships with referral sources that have lots of depth as opposed to many with little depth. Or as I like to remind myself, “Go a mile deep rather than a mile wide. You don’t have to share your deepest secrets, but you do need to let yourself be seen. Your clients need and want to a glimpse into who they are trusting with the most intimate areas of their life. They need to know that you understand them and empathize with them. Speaking from a niche mentality doesn’t mean you will only see that niche or one type of client, it just means in this moment you are making it easier for people who need you to find you, and speaking to them in that deep, heart place. 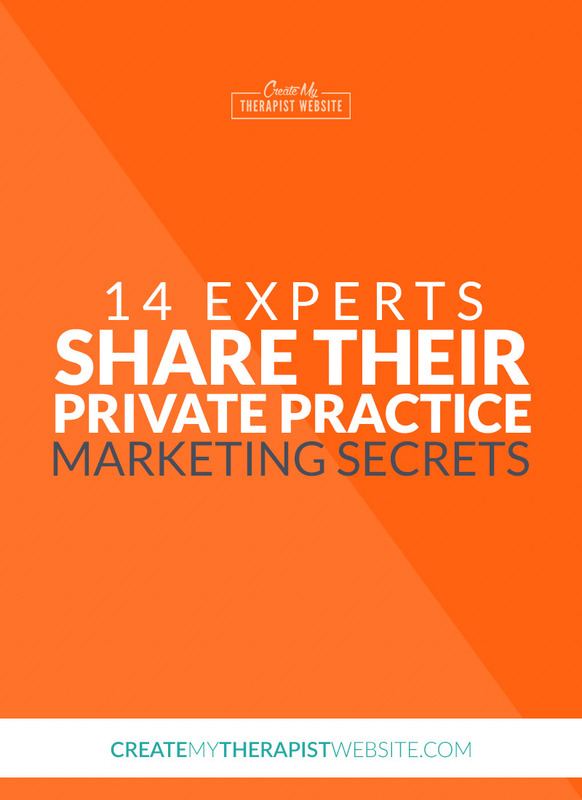 I’m so excited to share this new resource with you because it’s jam-packed with so many great tips for marketing a private practice. I love how each teacher has their own view and strength when it comes to marketing. 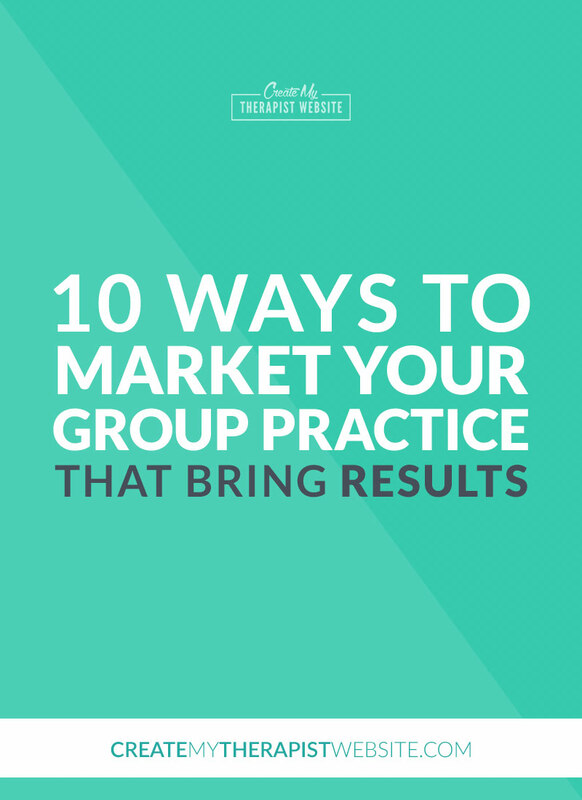 So you’ll be getting a well-rounded view of what you can do focus your marketing efforts and grow your practice. The holiday season is a perfect time to slow things down (or at least attempt to!) and plan for the coming year. So, I’ve taken a break from publishing new articles for the month of December. But I’m not going to leave you hanging. Below you’ll find some of my favorite and most popular articles in the Create My Therapist Website archives. I hope you get to enjoy some of them while sitting by a fire sipping your favorite hot beverage. 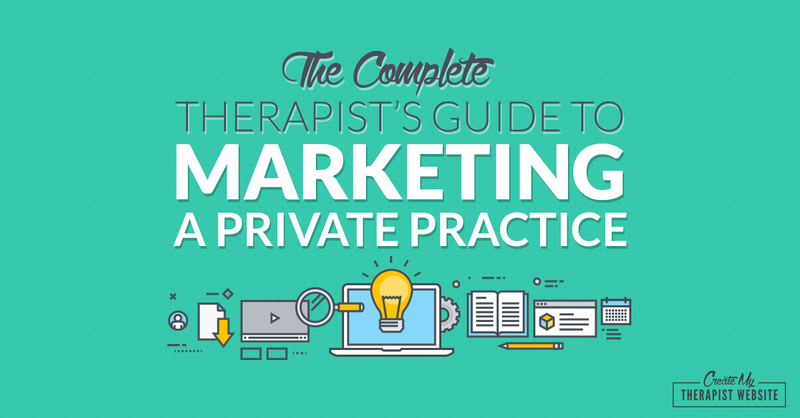 This guide is an essential resource to anyone looking for new ideas and strategies for marketing their private practice. 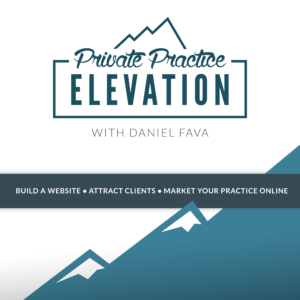 From getting started to building a website, content marketing, SEO and getting more referrals, this guide has all you need to start marketing your private practice strategically and attracting more clients. Pinterest is not JUST a place to find out how to make Christmas decor out of old palettes you found behind your favorite grocery store. Pinterest is also one of the BEST ways to drive traffic to your private practice website. 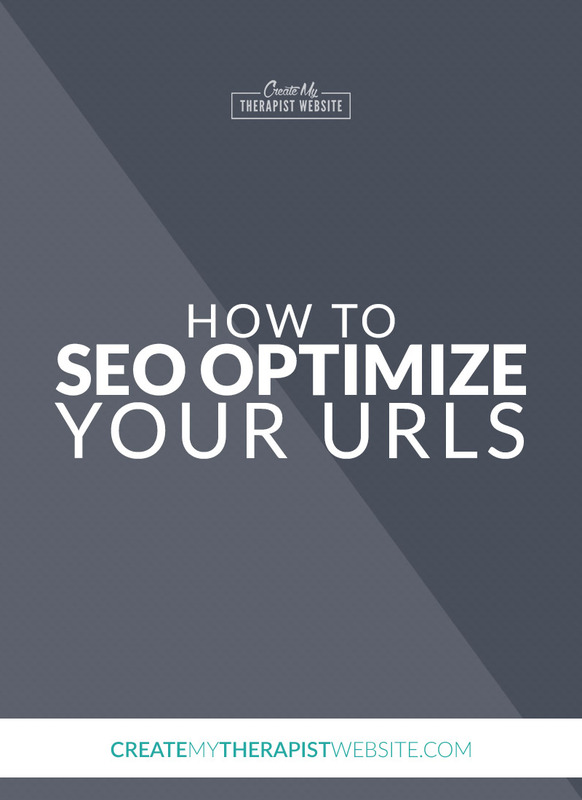 SEO (search engine optimization) doesn’t have to bring you pain in the new year. If I had to sum up my best SEO advice to you, it would be this: consistently publish new content and know the most important places to put your keywords. Then, be patient. Your website is one of the most important marketing tools you have. If it’s not bringing in new client leads on the regular, then something has to change. I LOVE making websites and I love helping therapists create websites that propel their practice forward. That’s why I offer one-on-one custom design services, as well as online courses… to help as many folks as I can grow their practice through their online presence. The website we built for my wife was KEY to her building up a successful practice back in 2011 and I can’t stand by and let other therapists miss out. 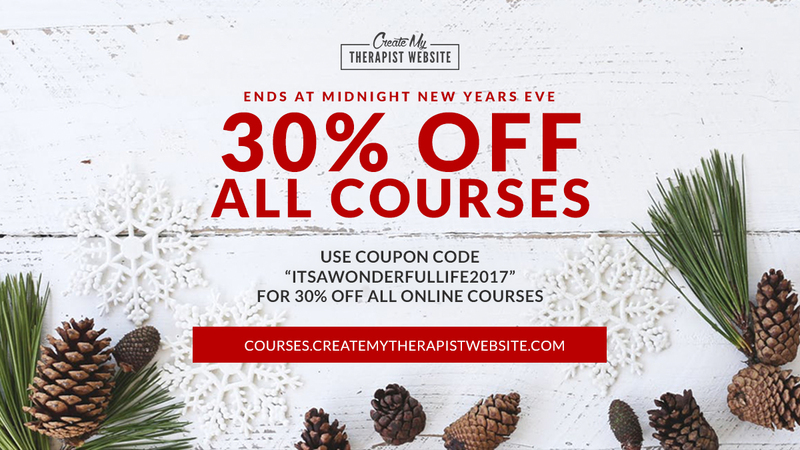 To ring in the new year, I’ve created a coupon for 30% off all my online courses. Ready to redesign your website or launch a new one? Just mention my favorite holiday movie, It’s A Wonderful Life, in the inquiry form and I’ll apply a 10% discount to your future project. Tired of wasting time keeping your WordPress files up to date or making changes to your website? Let me and my team do the work instead. Mention my favorite holiday movie, It’s A Wonderful Life, in the inquiry form and I’ll apply a 10% discount to your package. I hope you and your family have a blessed holiday season and wonderful new year. For me, this year has been a whirlwind, seeing our first baby born and learning to run a business and balance a family. Quite the adventure! I’ve also created some great friendships within the private practice community and have enjoyed so much connecting with more of my blog readers. And look forward to creating more opportunities to connect in the new year. Cheers to a great new year for you and private practice! I hate to say it, but as clinicians, we can be a little slow on the entrepreneurial uptake. We’re often so focused on serving our clients well, that we struggle to come up for air and think about the professional side of our practices. And, because we sometimes forget that we’re running a business as well as serving others, it’s not uncommon for those in the psychotherapy profession to neglect business-building activities. For instance, the idea of incorporating or even relying on technology in our practices is still a bit scary and there is a definite tension when it comes to clinicians embracing modern ways of networking and marketing. In fact, I literally get questions daily about how online marketing works and whether or not a fellow therapist actually needs a website. As 2017 draws to an end and we approach 2018, the answer is an unwavering and astounding YES! Yes, you need a website. But not only that, you need a well-designed website that is both visually appealing and speaks directly to your ideal client. Now, I’m “technically” a millennial so my willingness to embrace technology may be a bit skewed, but I’m being really honest when I say that even my 90-year-old grandma has an iPhone. This goes to show that no matter your ideal client population, they are online. Your website is your greatest business asset. It’s inexpensive to maintain and it works for you 24/7. Sure, there is an initial cost to set up a website properly, and whether you hire it out or create it yourself, there is a large commitment of either money or time up front. But take that money you spend and divide it into an hourly wage, and you’ll see that your website is actually your most underpaid employee. Your website is also your greatest gatekeeper. When your content is written in a way that speaks directly to your ideal client, you will not only attract them to your practice but repel those that are not a good fit. The same goes for posting your hours and fees online. Those who cannot fit into your schedule or afford your fees will move on. But, the calls that do come will be serious and motivated inquiries. Perhaps the best thing about having a well-designed website, however, is the fact that it is a marketing machine. I’m a big fan of in-person networking and believe it’s essential to growing and scaling any practice. But, it’s just not possible to meet in person 24-hours a day. What’s more, a client in need whose anxiety has him up at 3 in the morning can’t go in and see his primary care doctor. So, who better to turn to than good ol’ Google? Having an attractive website allows you to still be available despite the time of day or circumstances. It also provides you with an internet home base which acts as the hub of your online marketing. By now, we are well aware that we must market our practices to see any kind of success. There are just so many professionals in our field, that without a concentrated effort, we will never stand out from the crowd. However, many of the traditional ways we are taught to promote ourselves: in-person networking, business events in the community, forming partnerships with doctors and psychiatrists, hosting open houses, etc. all demand so much effort that they leave little time for us to concentrate on what we do best – therapy. The truth about internet marketing is that any AND everything that is posted online counts as content. This includes the raging rant we posted five years ago after being pulled over for a broken taillight when there are “real” criminals out there. And, it also includes the picture from last week where we are shaking hands with the police chief after implementing a mental health system in the county jail. Though hilarious (or mortifying – however you want to look at it), what’s difficult about marketing in 2017 and beyond is that nothing ever disappears from the internet. If it’s been posted somewhere, whether immediately “deleted” or not, it is accessible by someone, somehow. This means that all of the content we have ever created contributes to our online reputation and our web presence. The fortunate thing, though, is that content is cumulative. So, the more positive things you post about yourself personally and professionally, the better your reputation becomes. Positioning your brand’s message so it is easily accessible by those that most need your help is what is known as content marketing. Content Marketing is an extremely powerful tool for attracting clients and building a practice with much less effort and overhead than ever before. Utilizing blogs, videos, images, and website copy allows therapists to highlight themselves among all other clinicians in the area and position their practice as the one that is the best match for those needing services. What’s more, recent surveys show that technology such as the internet and Smart Phones are not commodities. Regardless of their socioeconomic status, clients are online. Therefore, content marketing is one way to reach populations that might not ever find their way to therapy through traditional channels. Lastly, content marketing is a fervent way for us to build practices we truly love and are excited about showing up to every day. Like I mentioned above, your website is the hub of your presence online. It is where your brand lives and where all of your potential clients should be going to find out more about working with you. The first impression, which is almost always visual, is what keeps these potential leads from immediately bouncing away from your site. However, it is the web copy (read: content) that draws the reader in and converts them from a prospect to a paying client. There are a few different ways a lead might land on your website. They may find you directly by putting keyword phrases into a search engine, they may find your website listed on a directory, or they may stumble across your business or rack card. In each of these cases, the prospect is what is considered a “cold” lead. They do not know you, and they have not received your name or contact information from anyone they trust. Once they have found you online, the only thing cold leads have to go on when deciding whether or not you are a good fit for them is the copy on your website. How you speak to potential clients has a profound effect on whether or not they pick up the phone to schedule with you. Talking directly to leads in a language that resonates will cause them to have an emotional reaction and believe that you truly understand what it is they are struggling with. Ensuring that your website is filled to the brim with such tailored content is the quickest way to earn a prospect’s trust and encourage them to get in contact with you. And it’s not much different for warm leads. 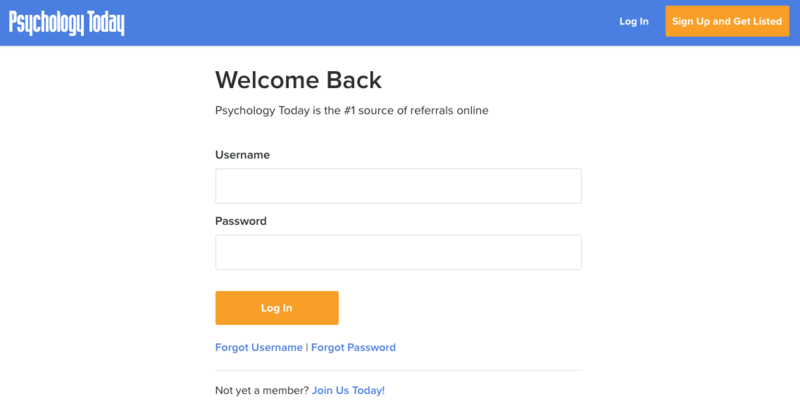 These are the people who come to your website through a referral. Whether they receive your name from a trusted doctor or loved one, in this day and age, the majority of people will still go to your website to learn more about you. While warms leads are a bit more primed to schedule with you, they can still be turned off if they don’t believe that you are the right fit for them. Talking in too general of a way is just not helpful. Without reaching leads at a core level, you will always leave readers of your website in a lukewarm state. But, if you’re able to get to the core of the prospect’s struggles, and speak to them on each and every page of your site, you can elicit an emotional response and motivate them to pick up the phone. So, what’s the key to speaking in a way that resonates with potential clients? What is Niche Marketing and Why Should Therapists Use It? The idea of defining your niche is still a bit controversial in clinician circles. One reason for this is there are some that think niching down is unethical as therapists who prefer a certain population are essentially denying services to some who may be in need. The idea, however, is not to deny services, but to offer therapy at a higher skill level. In fact, defining your ideal client allows you to hone your skills and become a specialist. So long as you are providing legitimate options and alternatives to those outside your niche, such as genuine referrals, you are not violating any ethical guidelines. Another common hang-up about niching down is that some therapists believe it to be too restrictive to build a thriving practice. It’s true, the second you decide to niche your practice, you are basically choosing to alienate a large segment of potential clients. By narrowing your focus to one slice of the population, you are effectively telling others that you do not serve them as well as you serve your chosen demographic. This can be really scary, especially when clinicians are new to practice or do not have a full caseload. But the reality is, defining your niche is the quickest way to fill a practice with clients you are excited to work with and that leave you feeling professionally fulfilled. 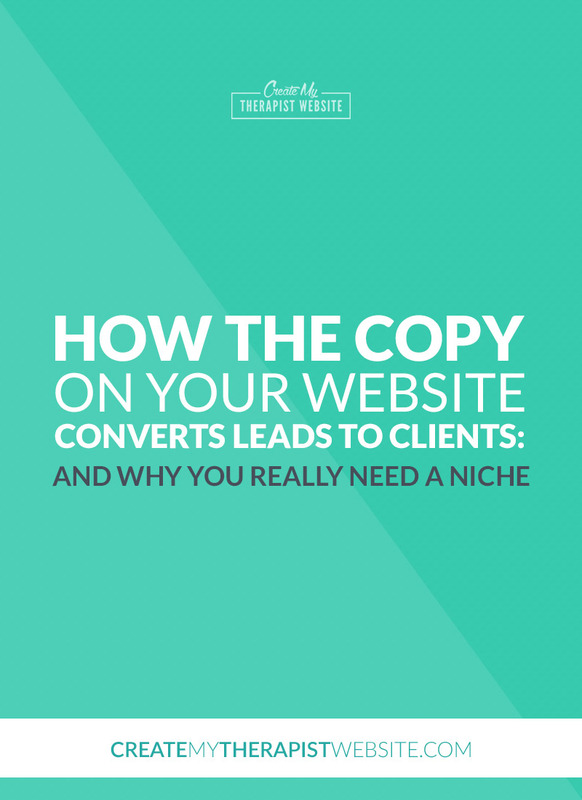 Incorporating niche marketing into your practice is the best way to write “tight” website copy. Copy that is too loose or that has too many holes in it will not speak to your ideal clients. It gives them too many opportunities to turn their attention elsewhere. However, web copy that is written with a niche in mind becomes sharp and provocative and resonates with readers at their core. So now that you know the importance of your website and also how integral your web copy is to attracting your ideal client, it’s time to figure out how to go about defining your niche. A lot of clinicians make the mistake of having a niche that is too wide. Again, this probably goes back to the fear of repelling too many clients and operating from a scarcity mindset. However, there are enough clients for every therapist to build a profitable practice, so there should be no fear about learning to attract a very narrow segment of the population. A great tip is to imagine the act of defining your niche as building an upside-down pyramid. The objective is to work from a wide scope and funnel the concept of your ideal client down until it becomes narrower and narrower. At each stage, ask yourself questions about your ideal client like “what is at the core of their presenting problem” “what is underneath this complaint” and “what is really going on here” to help you really learn how to target them. I always recommend going through this process five times so that you essentially narrow your niche down five levels. By the time you get to the fifth level, you have a completely clear idea of who you are marketing to and trying to attract to your practice. Now, that does not mean that this is the only type of client you will see. Some of your marketing will appeal to 20 or 30 somethings with anxiety or the parents of high-performing teens, but the core of your marketing message will resonate with a certain segment of the population which is the whole point. This exercise isn’t always easy to do right off the bat and takes some practice, but once you get the hang of it, it can be fun to brainstorm different ideal client populations you’d like to serve. If you need a little guidance when it comes to refining your niche, don’t worry, I’ve got you covered. Marissa Lawton is a licensed counselor, national board certified counselor, and member of the American Counseling Association. 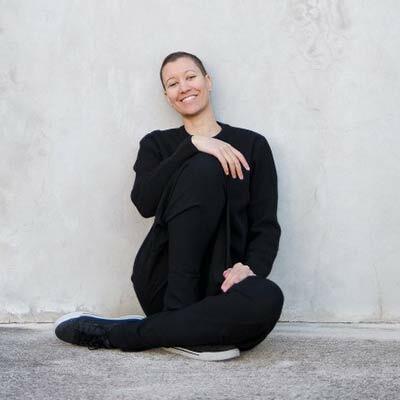 She is also an avid content marketer and lights up helping female clinicians build their private practices through strategic and tailored online marketing. 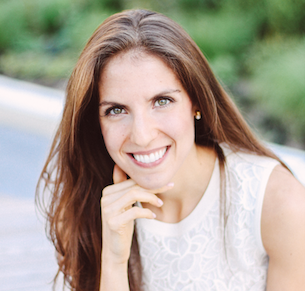 Marissa is the creator of The Clinician’s Guide to Content Marketing, a comprehensive system of masterclasses, concierge strategy calls, and boutique writing services that helps therapists identify their niche, find them online, and generate content that speaks directly to their ideal clients. When the majority of your day is spent working with clients, any marketing activity has to be something that has the potential to make a difference – as I am sure you will all agree with. But then, which activity to focus on? Should you create social media posts, blogs, instagram visuals, an opt-in PDF? And then comes the question I so often hear… “where do I even START?!”. Then maybe you do nothing for another day, week, or month from sheer overwhelm. The good news is, you are focussing on the right thing – serving your clients and potential clients. When clients are happy, referrals come your way. There is however, a content marketing method that I want to share with you that takes care of your private practice blog and your social media and acts as a lead generation machine. After all, gaining leads 24/7 – even while you are with your clients – has to be a win/win. “When you are working 1:1 in your business, time to create content needs to be maximised and make to work as much as possible for you and your business. The Power Post is a brilliant way to create a really valuable piece of content that works as an opt-in to gain leads for you, showcases your authority, and can be repurposed for evergreen visual content time and time again. In short, this is the ONE post you need to really move the needle in your business”. Jo created the system from learning the content strategies that work, and applying it to the way her clients needed to work. To know how to get authority QUICKLY and stand out from the crowd. A system you can DIY and/or begin to outsource. To create influence and authority without churning out content and not seeing results. 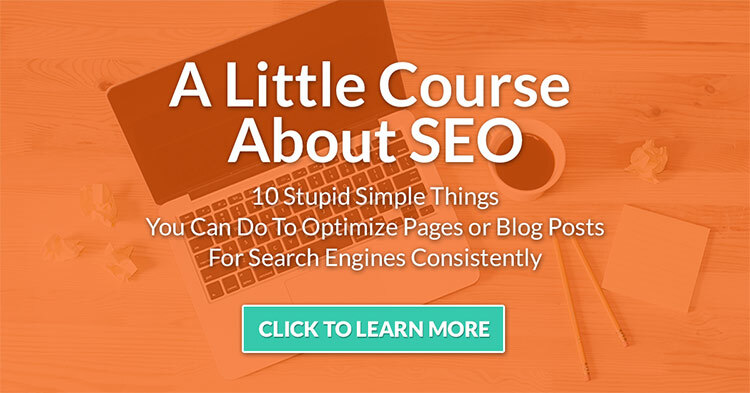 To create SUPER EFFECTIVE blog posts that rank highly, quickly, and get you leads that turn into clients. 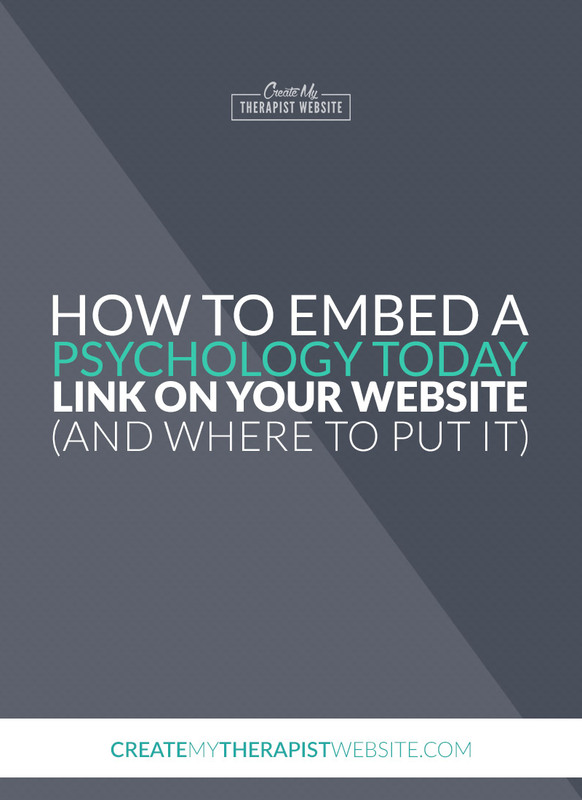 A Power Post is, effectively, a link post, which is GOOD news! Yup, you don’t need to create all the content yourself. The strategy works by creating a blog post that deals with a particular subject in your area of expertise and one that your ideal client will find irresistable. You then curate valuable links from other experts in your area that relate to this subject, and compile them into chapters. This example by Sarah Grafelman-King of Invigorate PT showcases how this works really well. 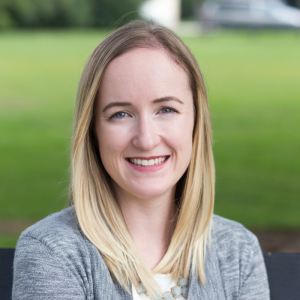 Sarah has created a bookmarkable guide to Dystonia, which acts as a super valuable resource for potential clients who are researching Parkinson’s disease. 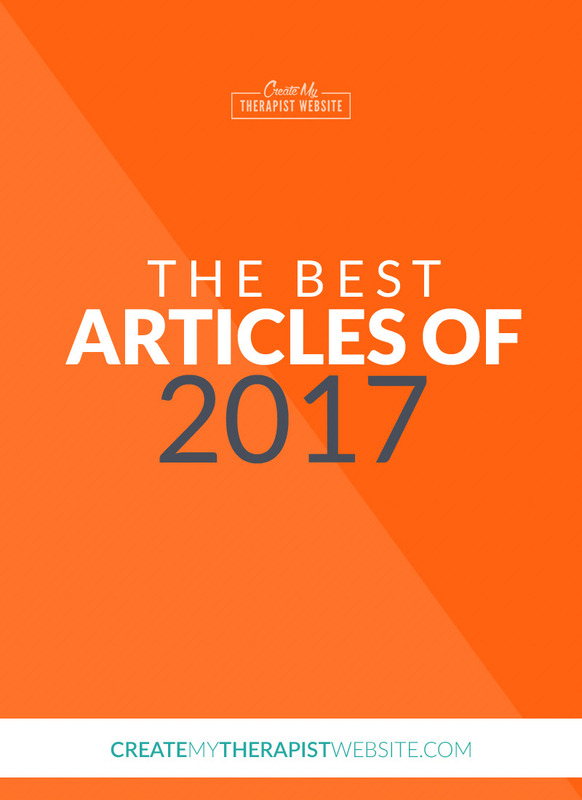 Sarah links to other articles which have valuable information on this subject, and adds her own take on things in the introduction and throughout the post. What this means is that Sarah has been able to create a brilliant post that add a lot of value to her audience, it has her tone of voice so we get to know her, and the best part? She didn’t have to personally create all the links she points to in the post. Now, while this might seem really easy to do – and it is! – there are a few elements of a power post that really make it work. Let’s take a look at another example, this time from Jo Gifford. Jo’s post on content hacks shows how you can create a post that looks amazing, that also acts as an opt-in. After reading the post, visitors have the option to opt-in and join Jo’s mailing list when they join here 5 Day Killer Content Kickstart Challenge. Other ways to offer an opt-in are to offer a PDF download, an added bonus piece of audio or video, or a loyalty card/offer code for subscribers only. The great thing about using this content strategy is that is does so much of the heavy lifting for you. It works as a fabulous SEO-rich post, an opt-in for lead generation, AND it can be re-purposed over and over again as quotes for visual social media, Facebook, Twitter, Pinterest and Instagram. With all that working for you, you can easily jump onto social media or your business blog and add content that is off the cuff and much less strategic, knowing that your lead generation machine is out there working for you. Creating a post like this can feel overwhelming at first, but once you know how it all fits together it’s something you can refer to again and again in your private practice. But, lucky for us, Jo has agreed to offer her live Power Post masterclass just for the Create My Therapist Website community… and at a special discounted rate! In her Power Post training, Jo offers live check ins as well as personal support and accountability to get the work done. 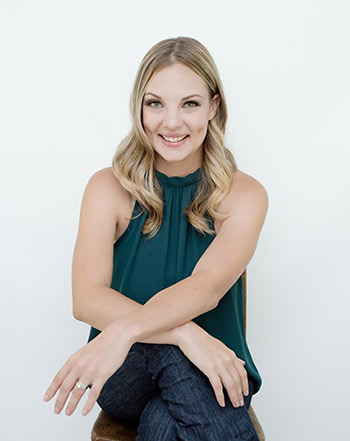 Jo says, “ I find that busy professionals find it hard to know where to start with content creation, and once we look at how to slice up the tasks and get productive my clients see huge results”. Learn How to Create Your Own Power Post with Jo’s 4-part Masterclass Series Starting October 16! If you’ve been struggling to create content that attracts your ideal client to your website, Jo has graciously offered to help. She’s agreed to lend her content marketing expertise and open up her masterclass JUST for the CMTW community. In this 4 part live masterclass series, you will learn to create authority-building content that opens doors, builds your list, positions you as a leader, and drives traffic to your site like crazy. 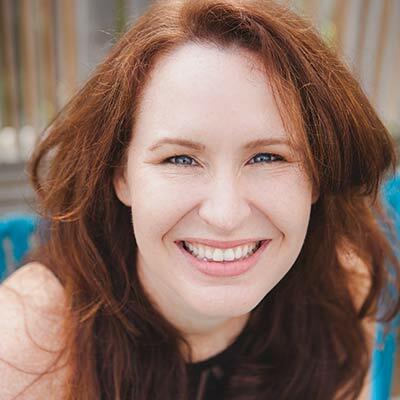 She will be covering the exact techniques you need to create content that your audience really needs, how to add to the conversation and build on existing authority, how to add extra value that leads to massive traffic and email list sign ups, and how to quickly position yourself online as a leader. You can get your space right here if you are ready to really power up your online presence and attract more clients. This masterclass begins October 16, 2017. Jo Gifford is a recovering overwhelmed entrepreneur with an addiction to making things easier. 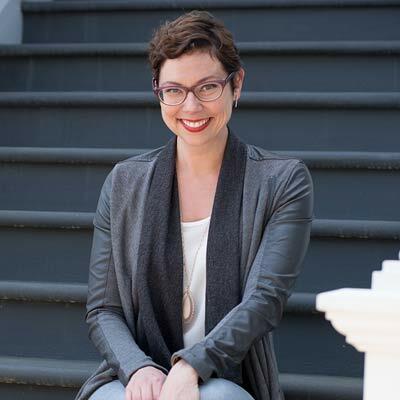 Champion of working smarter and creator of the Brilliance Ignition Process, Killer Content Academy and the Power Post training technique, she has a loyal global audience and a stellar client list of biz owners making big sales and a big difference. 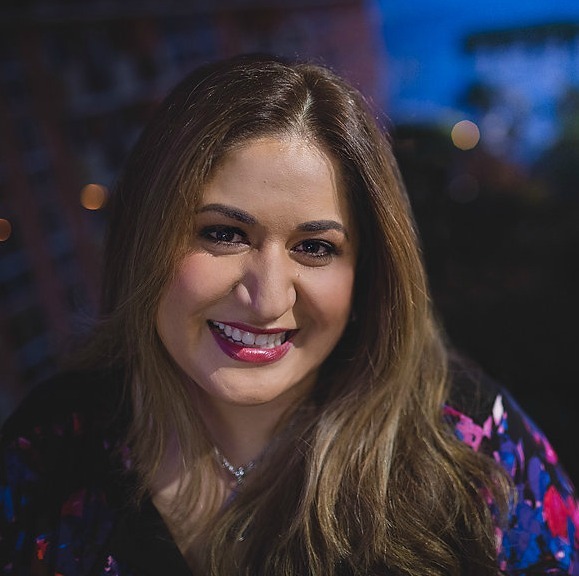 A widely read contributor to Huffington Post, Selz, Regus, Prowess, YFS Magazine, Fresh Business Thinking, B2B Marketing Magazine and many more, she is a respected UK voice on life as a pocket-sized enterprise owner. 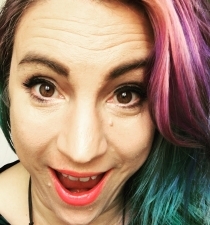 Jo’s background – a seasoned blogger, copywriter, podcaster and graphic designer with an MA and research interest in creative thinking for small business – makes for an eclectic and colourful killer content approach.